When I look at celebrities’ make-up, I always check to see how they’ve done eyeliner. If there’s one element of the face where you have to get it perfect it’s eyeliner. If it’s smudged or it’s too big or too winged then you just don’t looked groomed. If you don’t have much confidence, a pencil is easier to use than a liquid liner. Draw on a thin line. Before you start, I advise checking the state of your kohl pencil. Is the tip sharp enough? I carry a pencil sharpener with me everywhere I go because a blunt pencil means a less accurate line and it only takes two seconds to sharpen. Secondly, I find if you heat up the kohl slightly then it’s easier to use. Rub the sides between your fingers or use a lighter or a match to melt it slightly. It glides on smoother that way, and if it’s smooth you’re more likely to get a line the flows rather than stopping and starting. I advise picking your liquid liner carefully – not all brands are great. Look for the size of the tip. The shorter the tip, the more detailed you can be as you have more control over the line. The Tom Ford liquid liner, which I love, has two ends – one with a short tip for detail and one with a wispy tips or creating flicks. If you want it to last a long time, make sure it’s waterproof. Also, do some research and see how much pigment the liner contains. Illamasqua liner has a great reputation for having a strong pigment, which will take you from day to night. 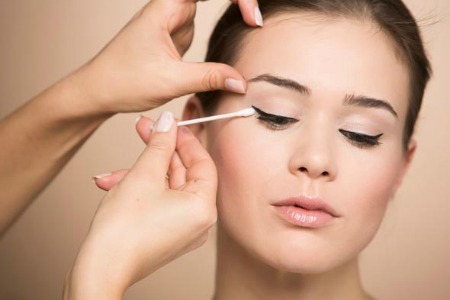 Dip a cotton swab in eye make-up remover so you can remove splotches and make the line sharp. Take your time over this as you don’t want to remove any of the actual line. Hold the cotton in your right hand and use the left hand to stretch the skin as stretched skin shows the accuracy of the line better. Remember to keep some cotton swabs in your make-up bag so you can touch up your face during the day / night. Wrap them in a small plastic bag or they’ll soak up dirt from the inside of your make-up bag. Use the handle of a tea spoon to draw the flick and the curve of the spoon to fill it in. 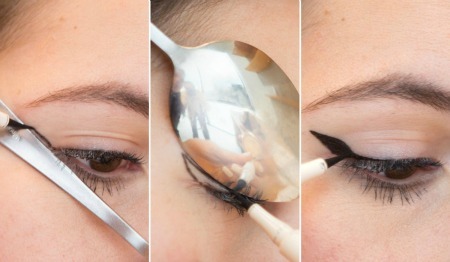 Obviously, this only works if you’re at home as most people’s make-up bags aren’t big enough for a spoon. But once you’ve created a flick at home, if you fill it in and touch it up during the day then it will last. Again, take your time as it’s important to get a shape you’re proud of that you want to show off all day long. If you have more space in your eye area, people notice your liner more. Give yourself more space by shading a white highlighter above and below your brows. Brows frame the face, so do remember to keep your threading / waxing appointments and carry some tweezers. 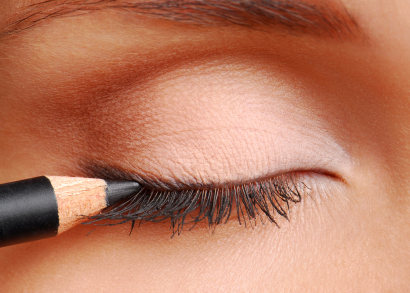 Eyeliner draws attention to your entire eye area, and you don’t want to point out scruffy brows. The effect we’re aiming for is groomed, glamorous and gorgeous and everyone can achieve it! Are you feeling braver to try this now? Let us know how you get on – tweet @livelikeavip or tag us on Instagram, livelikeavip. Good luck getting glamorous!